Storm appreciation plaque for their outstanding effort and support during Desert Storm. Joining the presentation were Colonel James F.
Cashman, USAF, commander, DCMD North- east and Col. Ronald M. Kuhn, USA Com- mander, DCMAO, Garden City. Peck & Hale outfitted new ships as well as helping to extend the lives of older class ships, such as aircraft carriers, frigates and amphibi- ous ships. Throughout the company's history, more than 8,500 commercial and naval vessels around the world have been outfitted with Peck & Hale equipment. The primary equipment supplied included vehicle tiedowns and lashings, ammu- nition shoring nets, aircraft securing fittings and safety nets. Peck & Hale was asked to respond to the special requirements of the confrontation and outfitted many ships in a matter of days. Peck & Hale was also asked to supply equipment that was desper- ately needed for three ships which were to be deployed to the Mid-East. The company's expe- dient response to this emergency has resulted in the presentation of the Desert Storm apprecia- tion plaque. Innovations for the 21st Century". Topics will include cargo handling systems, seismic consid- erations in port design, beneficial use of dredge material, unique solutions to port rehab, artifi- cial islands for the U.S. and abroad, environmen- tal issues and solutions for ports to know, port operations and exogenous variables you can't control, fire protection and port design, access for handicapped and many more subjects. U.S. Section, PIANC, 20 Massachusetts Ave.
Laval equipment on board will include low-tem- perature and high-temperature coolers, an HFO cooler and a Nirex freshwater distiller. J.H. 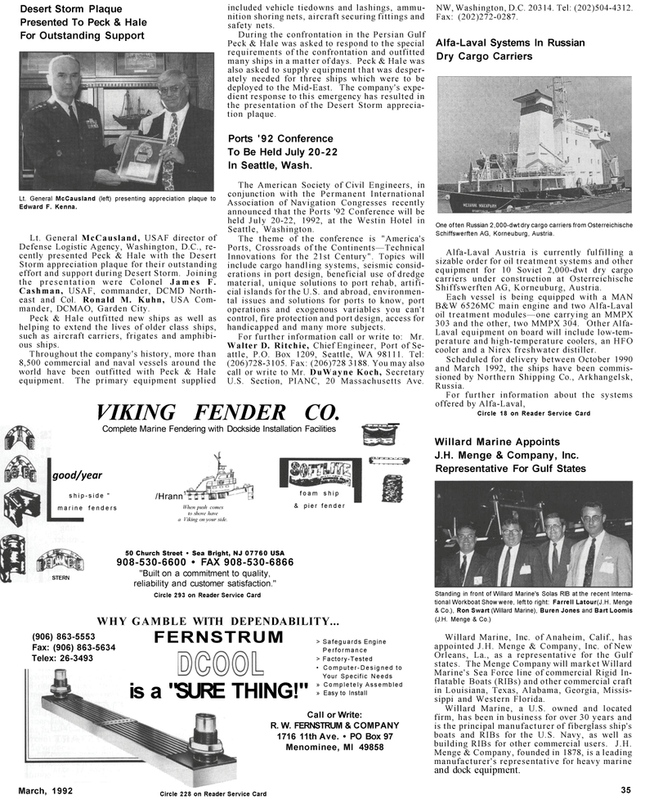 Menge & Company, Inc.
Marine's Sea Force line of commercial Rigid In- flatable Boats (RIBs) and other commercial craft in Louisiana, Texas, Alabama, Georgia, Missis- sippi and Western Florida. Willard Marine, a U.S. owned and located firm, has been in business for over 30 years and is the principal manufacturer of fiberglass ship's boats and RIBs for the U.S. Navy, as well as building RIBs for other commercial users. J.H. STERN 50 Church Street • Sea Bright, NJ 07760 USA 908-530-6600 • FAX 908-530-6866 "Built on a commitment to quality, reliability and customer satisfaction."